These bold Turbo 8s have great low-end delivery best suited to large controls rooms and spaces. Big powerful sound. Well constructed. Smooth top end. Mid range is less successful. Monkey Banana is a small German monitor company with a range of visually distinctive active monitors and an equally memorable name. 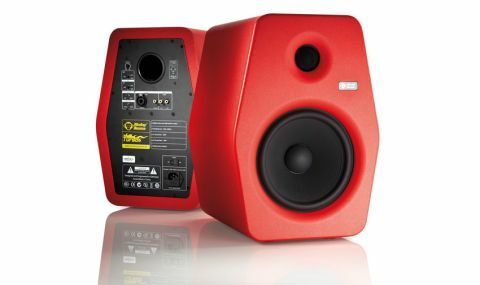 Available in four sizes (4-, 5-, 6- and 8-inch woofer), with a matching 10-inch sub woofer completing the line up, prices range from £400 to almost £800 per pair, and it's the top-of-the- range Turbo 8s we have up for review. The Turbo 8 is a rear ported two-way bass reflex design with 8-inch woofer and 1-inch tweeter. It uses two class AB amplifiers (power rated at 30 Watts and 80 Watts for the tweeter and woofer respectively). The distinctive hexagon-influenced shape is designed to reduce internal standing waves, while the high density fibreboard construction is both solid and weighty (each unit weighs around 12kg). "In conjunction with the channel selector switch (left/right) they're very easy to set up from a single stereo digital output"
The front of the baffle includes smooth waveguides and both drivers are recessed from the face. The front also sports a rather spiffy illuminated logo. Round the back, analogue connections are made via either the combined XLR/Jack socket or phono. Rather usefully, the Turbos also include digital input via S/PDIF (up to 24 bit 192 kHz), with a pass through connector (also on phono). So, in conjunction with the channel selector switch (left/right) they're very easy to set up from a single stereo digital output. Each unit is also individually switchable between analogue and digital input. Rear panel controls include three centre-notched rotaries (level, LF and HF), with the EQs offering +/-6 dB at 100 Hz and 10 kHz respectively. Finally, these Turbo 8s come in two colourways: black, or the bright red finish of the review units. The first thing we would say about the Turbo 8s is that they are pretty large and powerful monitors, pushing the limit of what you would consider near fields. Thankfully, construction is excellent and the choice of quality components (switches, rotaries and drivers) should sustain continuous professional use. As far as set-up is concerned, the Turbo 8s include some stick-on padded feet which come in handy for table-top use. Beyond this, the rear ported design obviously means keeping them away from the wall slightly. In fact, with bass-heavy music these can generate some serious low end, and we found it wise not only to bring them into the room more than we'd planned, but also to trim back the LF control a couple of dB. "The low mids and low frequencies are full and rounded and very powerful"
This helped, but we were left wishing we had an HP filter as well to further tailor the subs. The Turbo 8s have a very smooth top end, while the mid range and upper mids are very laid back. This means they are both non fatiguing but also a bit polite, particularly alongside typical studio monitors where these frequencies are more upfront. In contrast, the low mids and low frequencies are full and rounded and, as noted, very powerful. For us, this is where the Turbo 8 monitors really shine and they would be a good choice as a tracking or vibe speaker, particularly if you're making club music. But for mixing, we think the relaxed mid range is less successful, and even after some tweaking of the HF control, we couldn't elicit quite the detail we were looking for. Overall, the Turbo 8s are well constructed monitors that deliver a powerful sound that is best suited to larger or well-treated control rooms. For more regular mixing duties it would be worth checking out Monkey Banana's Turbo 6s.